In 2002, I moved to Phoenix, AZ and began to learn a lot about my new environment and city. Yes, I am a southern belle and I was born and raised in south Louisiana, a lush sub-tropical environment. However, the desert has its own beauty at all different times of the year and I enjoyed discovering the nature there as well as learning about the western and Mexican cultures in my new home. Eventually, I met and began dating a local chef. From him, I learned many new things in the kitchen but I just loved his Chicken Enchilada's!! One lazy Sunday afternoon, we spent some time in the kitchen and he taught me his secret recipe. This is adapted from his restaurant recipe into a family kitchen recipe. Rub chicken breasts with a light coating of olive oil and sprinkle both sides with fajita seasoning and Tonys. Roast in a casserole dish at 350 degrees until done, cool and cut into bite size pieces, set aside. While chicken is roasting, mix soup, sour cream, green chili's, more fajita seasoning, Tonys, salt and peppper in a medium bowl and set aside. Chop onion and set aside. When chicken is cool and chopped and set aside in a different bowl, add pan drippings (from the casserole dish they were baked in) to the sour cream/soup mixture and stir. Open flour tortillas and put a line of chicken down the length of the center of a tortilla, do the same with the onion and some cheese. Fold/Tuck/Roll up each tortilla and place seam side down in the same casserole dish the chicken was baked in. Sprinkle any remaining chicken and onion on top. A second casserole dish may be necessary to accomodate all. Pour the soup/sour cream and chili mixture on top of enchiladas. Spread until all are coated well. 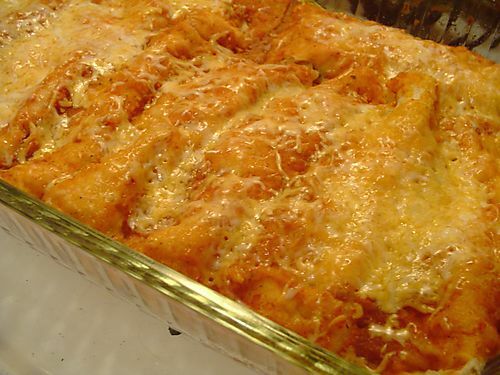 Pour and spread enchilada sauce over all and heavily sprinkle cheese on top. Bake at 350 degrees until cheese is brown and all is bubbly. These make great leftovers and they also freeze well!